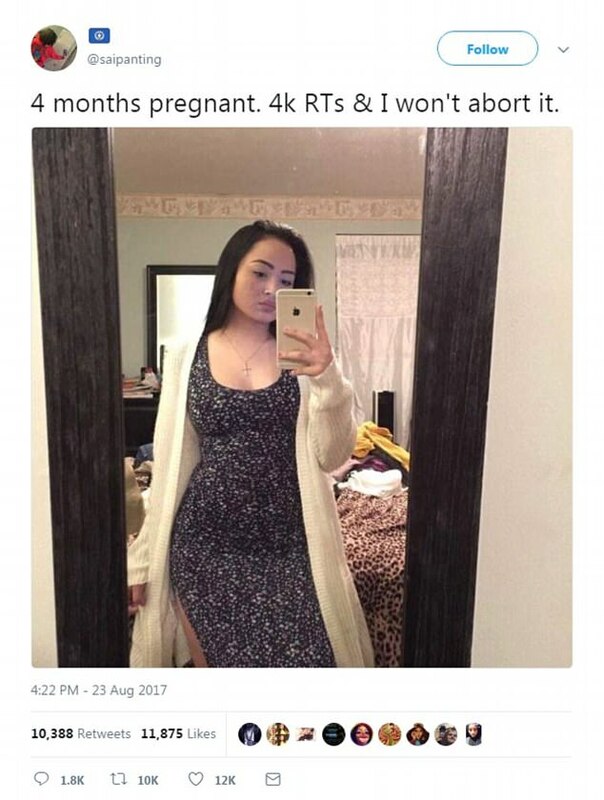 A woman's sickening tweet threatening to abort her baby unless she gets 4,000 retweets has gone viral. The tweet, a joke in poor taste, sparked outrage on social media before she posted again to say she wasn't serious. The woman calls herself Saipanting online but her real name is not known. On Wednesday, she uploaded a selfie which showed off a small baby bump and wrote: '4 months pregnant. 4K RTs & I won't abort it'. Her initial post sparked an animated thread with another Twitter user who claimed to be the unborn baby's father. Thousands dismissed their posts as an attention-seeking stunt to gain followers, questioning whether she was even pregnant in the first place. Expectant or not, the woman was slammed as 'despicable'. Within days of it being posted online, she had more than 10,000 retweets and 11,000 likes on her picture. Screenshots of her heated exchange with the baby's apparent father also went viral. She shot back: 'Sorry you had to find out this way,' to which he replied, 'Holy s***'. 'That's why I asked you for money but you blocked me so f*** it,' said the woman. His response revealed an even more outlandish scenario. Well that backfired, didn't it? If she was joking she should've phrased it a little better to make sure people knew she was joking...or is it that we've forgotten how to see when someone is joking because we are all too serious nowadays? thought you were a big fan of aborting innocent children?? her body her choice and all that good moral and principle stuff?? Erm, that's not what the thread is about smelly. Did you read it? What a sick joke. Nothing funny in that. eddie wrote: Erm, that's not what the thread is about smelly. Did you read it? was the abortion in the title a red herring?? Some people will do or say anything to become an internet "star". Okay, you being deliberately ignorant is a waste of time for both of us. Let's agree to part ways on this one. Yeah, I'm wondering why she ever thought that she was going to be a comedic genius for that brain fart. That 'bump' could just as easily be gas from too many beers or cokes..
Or maybe even an early sign of her future "middle age spread".